Electronic equipment is damaged more often by power disturbances than by fire, theft and vandalism combined. Intermittent power problems are the most expensive hidden expense to users of microprocessor-based equipment. The OM-PQR1010 power quality recorder is a state-of-the-art, fully integrated instrument that measures, records and reports power disturbances, aiding in the analysis of power quality in medical, commercial and industrial applications. The OM-PQR1010 monitor unit will detect a wide range of power disturbances including spikes, sags, surges, common mode noise, dropouts and high frequency noise on two phases of ac voltage and one dc voltage channel; it will also test the temperature, humidity and ac current. 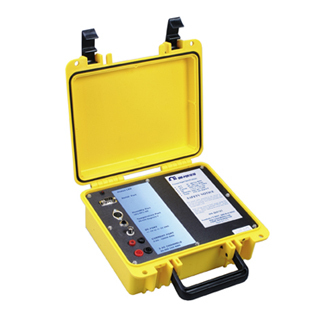 For ac current measurement, the OM-PQR1010 is equipped with a pair of banana jacks designed to accept a 10 mV/output current transducer (CT). Disturbances detected on multiple channels are recorded by their time, date, magnitude and duration in a non-volatile RAM memory. Stored data can then downloaded and analyzed by connecting the OM-PQR1010 to your PC’s serial port and running the included Windows data analysis software. Input connections to the OM-PQR1010 are made between the safety connectors on the back of the unit and the circuit panel to be tested. The OM-PQR1010 operates on standard 110 Vac/220 Vac power. Once plugged in, the OM-PQR1010 immediately begins testing the signals on the input connectors. Windows 2000/XP analysis software, temperature probe, one set of ac voltage test leads and one set of dc voltage test leads. Humidity probe must be ordered separately.